← New T-Shirt Designs Available from Cooper’s Pack! Need a fun 2-person card game to play while traveling? 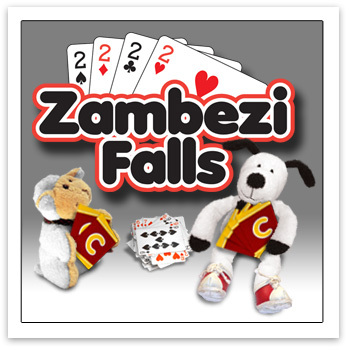 Cooper has just released his first original card game—Zambezi Falls. Perfect for travelers of all ages, Zambezi Falls was invented by Cooper and his Handler while traveling through Africa. The game is fun, addictive, and of course portable (you can play anywhere). Even better, you don’t need an internet connection, technology or batteries…just a deck of cards. Cooper will send out a free copy of any of his books to the first two people who give it a try and let us know how you liked the game. Visit Cooper on Facebook or contact him by email. This entry was posted in Cooper's Blog, Games and tagged card game, card games, children's travel card game, children's travel games, children’s card game, kids card game, kids card games, kids travel card games, kids travel tips, travel card game, travel game, travel tips, Zambezi Falls. Bookmark the permalink.